A Dollop Of Me | family, food, healthy living, life's tidbits: 1st Babysitting Experience! People around me know that while I love being with babies and kids, I have never actually taken care of one before. I was chatting with a dear friend when she asked if Roboman and myself could spare a few hours babysitting their 2.5 month old. It was her wedding anniversary and she and hubby desperately needed some time out by themselves, and to relax by watching a movie. My heart surged with excitement when she asked, but I was also understandably apprehensive, asking her if she was sure, seeing that I have zero experience. The sweet mum replied that everyone has to learn, and that I wouldn't do anything they as 1st time parents haven't done! So the date was set and I turned up after work at their place. 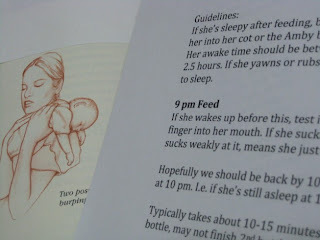 She had already prepared a clear instruction sheet about what I had to do - what time the baby was expected to wake up, how and when to feed etc. Then she turned to me and asked: "Have you gone for your prenatal classes yet?" I sheepishly said, no, half expecting her to freak out. But the cool parents simply pulled out a stuffed toy, and proceeded to show me how to burp a baby! They also left me with a baby book tagged at the relevant pages. I passed them our car keys and shooed them off for their date. I saw that 9pm was the expecting baby wake-up time, so I lounged in the living room reading from their very comprehensive library of parenting books. The rest of the evening was filled with an unexpected early waking up of the baby, me panicking and calling the mum and getting confidence from her cool assuredness over the phone, trying to pacify the bub for over an hour through rocking, singing and patting, mistakenly thinking she was hungry and putting the bottle to her mouth, Roboman talking very loudly to her (as opposed to what I thought should be a soothing voice), she calming down when Roboman played a Baby lullaby CD, checking her head/hair when I noticed she kept grasping one side when she cried, and I embarrassingly forgetting that babies should be rocked up and down and not side to side (we BOTH read the same literature but it looks like Roboman has better memory!). Finally, when the parents came back, the baby had already slept through her feed time as she was crying too much before. I was feeling kinda worried that we did something wrong =P Thankfully the parents seemed more amused at us, and assured us that everything was fine and normal, as she was colicky and does that sometimes. They were particularly amused when I told them about me checking her head/hair. Apparently the baby grasps her hair when she is frustrated. (Later I found out that another friend's baby does that too! How interesting). I found myself thinking a lot about that sweet baby for the next few days. I'm grateful for the experience and for our friends trusting their baby with us. Even while they thanked us for our time, I felt thankful instead that I had gain so much just by actually getting the opportunity to take care of a baby (although I ended up not getting to feed, burp or change her). It sounds like a great first-hand experience! Hahaha, your boy will be easy to look after! He's such a cheerful little one :) Our friends don't have help though, so it was really time-out for them! I think I really have the parents to thank coz they were really cool about everything, and very encouraging! Otherwise I think I would have been quite stressed. Yes it was an excellent experience. It helps me to visualise what it could be like having my own baby. Wow, really? But I guess with Nat it came naturally for you then :) I am ok with carrying babies - even brand-newborns. Just haven't actually taken care of any till that evening! Maybe not as often, you're right! Will be busy. Nothing like actually doing it. Esp for me too, coz I learn best by doing. That is the best practice you can ever have - on a real baby! I can volunteer my Elliot too, I'm also very relaxed about him, hahaha! Think we'll be doing lots of experiments with Bubbles though! Heh, since most things will be first trys! Yes, nothing beats the real thing! Your Elliot seems to be so happy and sweet-natured - he must be a joy to babysit :) Great that you are too an easygoing mum - I hope I will be too, and not get bogged down with my own and others' expectations! Haha, thanks! Didn't feel that brave though!